#YouHaveControl | Team FITA, & Team Bader, fly from Elstree EGTR to White Waltham EGLM. Freedom in the Air (FITA) is delighted to announce that our founder, Gautam Lewis, has accepted an invitation from The Douglas Bader Foundation (DBF) to become one of the Charities Ambassadors. Student pilots at FITA try and emulate the unbreakable spirit of Air Ace, Group Captain, Sir Douglas Bader. To celebrate the work of both not-for-profit organisations, Gautam took David Bickers, CEO of The Douglas Bader Foundation flying. The duo flew from Elstree to White Waltham, once home to Douglas Beach Baron aeroplane. Here is a short film from their flight. In 2007, Gautam fulfilled his childhood dream and became a qualified pilot, passing all his ground and air examinations in just six months. Still dependent on crutches from his childhood battle with polio, he was inspired to find that the world of aviation had catered for his condition. In October 2007, he founded Freedom in the Air, a flying school for people with a range of disabilities. Freedom in the Air currently have a training facility in Elstree, Hertfordshire, where they offer disabled people a spectrum of experiences and qualifications – from sample flying lessons to flight instructor courses. They work with Modifly, a purpose built facility in Birchwood, Yorkshire, where aircrafts are modified to cater for the bespoke needs of their pilots. The not-for-profit organisation is committed to empowering disabled people through the freedom that flight offers, benefitting on an emotional, physical and professional level. 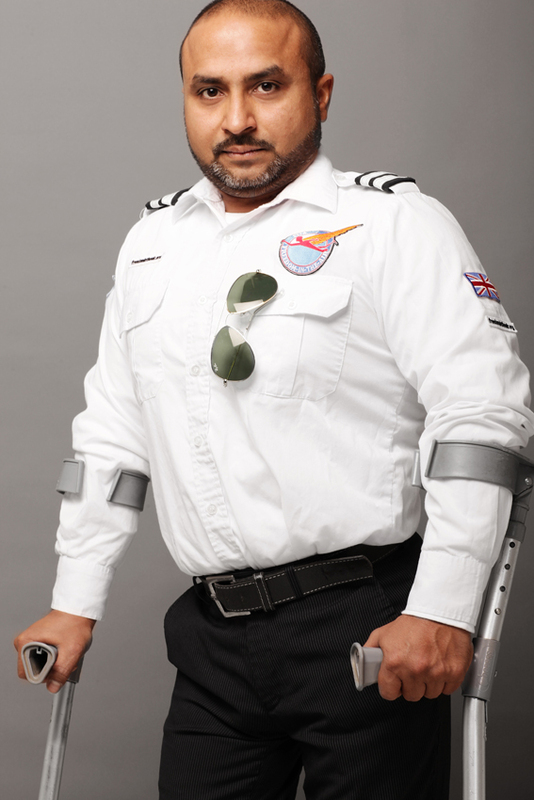 Gautam is keen to highlight that Britain has a tradition of inclusive aviation, dating back to Sir Douglas Bader, the double amputee and Royal Air Force fighter pilot who flew a number of aerial victories during the Second World War. ‘Essentially anyone can fly with the right teacher’ Gautam says. ‘It is about challenging stereotypes’. The British Women Pilots’ Association awarded him their Special Recognition Award in 2013, for his work towards making the world of aviation a more democratic place. Gautam is also committed to the fight against polio, as brand ambassador for the Global Polio Eradication Initiative (GPEI), a partnership of UNICEF. He has highlighted the need for immunisation, especially in communities where the culture resists vaccinating against preventable diseases. In 2009, the Al Jazeera TV network aired a documentary entitled Passport from Polio, which followed Gautam’s return to Kolkata to promote the immunisation of babies against polio, working with a mobile immunisation team in local communities. Gautam photographed his trip and the images were shown internationally as part of an exhibition entitled Full Circle. Gautam Lewis was born in Kolkata, India in 1977. At three years old he was abandoned after contracting polio and spent two years at Mother Theresa’s Missionaries of Charity. He then had a further two years of operations at the Rehabilitation Centre for Children just outside the city, where he was introduced to Dr. Patricia Lewis, a nuclear physicist. Patricia adopted Gautam and they moved permanently to England, where Gautam attended the prestigious Bedales School. After obtaining a business degree, Gautam became immersed in the music industry and worked for a number of renowned management agencies, including Ricochet Artist Management, Creation Management and Poptones Records. While working at Alan McGee’s Creation Management, he co-managed bands such as The Beta Band, Kathryn Williams, The D4 and the notorious The Libertines, during Pete Doherty’s time in the band.